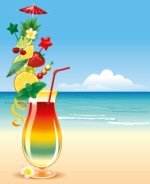 Luau Party Recipes for Senior Parties offers luau foods and beverage recipes to complete your luau party plan. 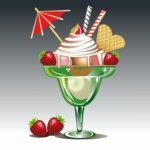 While there are literally thousands of hawaiian luau recipes and party food recipes you could incorporate in your senior parties; these are simple, easy to follow, mostly do ahead, and nourishing luau party recipes of the Hawaiian luau foods you have loved over the years, and some twists to some old classics that just work well with the rest as a group. 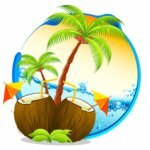 There are just endless selections of luau party recipes from luau pig roast, luscious luau bread, party punch recipes, to sweet hawaiian luau cake. While those ideas are wonderful, that is not what this is all about. 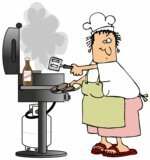 This is about senior parties, and specifically in this section, it's all about a luau party plan where senior people meet and have fun while sharing some simple hawaiian luau food and some easy dinner ideas. With that in mind . . . While this is not quite authentic traditional Hawaiian cuisine per se, the combination of luau foods work well together. It is a pretty extensive selection of luau menu food ideas to prepare. However, most everything on this luau menu can be prepared ahead of time to leave most of your time to your guests when they arrive, which is where you want to be, right? You're the main attraction for your senior parties. You’ll find a wide array of Hawaiian flavors infused into some American favorite dishes for party food appetizers for your senior parties. However, I have never met anyone who liked the flavor of Poi. If you like it, I am sure you can get it; or you can definitely purchase a substitute like Hummus. My palate does not allow either of these in my mouth; so due to lack of expertise on either, I have chosen to eliminate them in my party luau food ideas. I'm sure you can gather some good senior stories regarding this nasty little three letter word. Part of any luau party plan, should be thinking outside the box. There's a reason I have Grape Leaves for part of the luau menu foods. Grape leaves are a chosen substitute for the traditional luau menu item of Seaweed wrap. I find it more flavorful, easier to work with and to purchase, and desired by most of the two. It also does ahead beautifully, even days in advance. You will find I do a great deal of bake-in-the-bag luau party recipes. The reason, it keeps all the flavors from escaping; it keeps the food moist, and it conveniently helps with do ahead recipes, and it’s more of a modern convenience than a necessity. It is strictly a matter of choice for easy dinner ideas for your senior parties. If you have beautiful oven ware that you can take from the stove to the table with a covered lid, this will suffice also. These luau party recipes and ideas are very flexible and can be changed on a whim for your senior parties. You may decide you don’t want to do cocktails, appetizers, full entrée, desert, and after dinner beverage. Fine. You can adapt each luau party recipe into formal type dinner entrees or simple buffet style type setting for a Cocktail and Appetizer party. This menu is very accommodating. It’s your luau party recipes, and you can do it your way. Pour Apple Juice in large pot (no aluminum) and start heating. Use tea bag container or gauze fabric to isolate the cinnamon, cloves and nutmeg. Drop in apple juice and simmer uncovered for about 20 minutes. Remove spices and discard. Mix spiced apple juice with all other ingredients. Pour prepared punch into serving bowl and garnish with lemon slices and sprinkle with Chinese Five Spice. Serves about 14-16. This is always a hit as a staple for luau party recipes. If alcohol is desired to make this Hawaiian luau punch, add 1-2 Cups Meyers Dark Rum to your party punch recipes. Garnish with pineapple, cherries, grapes, and mint sprigs, and any other decorative items you desire. This is a good place for those little umbrellas and colorful straws that are especially popular for senior parties. Use patio glasses or coconut shells or pineapple shells for effect. Yield will be less with the last two containers. Mix all ingredients and pour over ice then add garnish and floats to kick off your senior parties luau menu. Place all ingredients in blender and blend on high. Strain to remove pineapple pulp then pour into glass and garnish with fresh pineapple slice, cherry, mint leaf, and straw. This cocktail works well to begin your luau party plan, and enjoyed by all at your senior parties. It adds a flair of creative colors that please guests as any addition to your luau party recipes. In a small glass bowl, place Light Soy Sauce, Wine, Brown Sugar, Fresh Ginger sliced thin, Spicy Mustard, Honey, Garlic, Salt, Black Pepper. Mix well. Put aside while you prepare the pork loins by sprinkling with salt and pepper. Clean and chop cabbage and green onions into larger than bite size pieces. Clean and slice mangos. Load bottom of bake-in-bag with this mixture for pork to nestle in. Place the pork in the bake-in-bag and pour marinate over the top of the pork and cabbage. Close bag temporarily. Refrigerate overnight to marinate, but turn pork a few times in the bag. (You're going to love these do ahead luau party recipes for senior parties). Remove only the pork from the marinate bag. Heat a skillet with olive oil (or use outdoor grill) to seer the pork on all sides. Set aside to cool for a few minutes before putting back in the bag with the cabbage, green onions and mango. Be sure to seal bag and puncture in one or two places on top for ventilation. Bake in a pre-heated oven with medium temperature, 350 – 400 depending on how your oven is calibrated. Shouldn’t take more than 1 hour to 1 1/2 hours. Best to use a thermometer and make sure it registers 170 degrees before removing from oven. Allow pork to rest in the bag for 10-15 minutes before opening. Remove any visible fat from ribs then rub with Pork Rub. (I prefer Grill Mate Pork Rub). Rub well on both sides of ribs and place uncut in baking bag and seal. Refrigerate overnight or at least several hours. A good time to work on other luau party plan. Mix remaining ingredients in saucepan (except cornstarch mixture). Heat to slow boil and add the cornstarch mixture slowly, stirring constantly. Sauce will thicken slightly. Cover and cook over low heat about 5-10 minutes. When sauce has cooled, refrigerate. Next day, bake ribs in the bag until tender and juicy in oven around 350-400 degrees for approximately 1 ½ – 2 hours. Open bag to test ribs. Baste both sides of ribs with sauce and place on hot grill long enough to heat through and seer the outside for color. Baste a few times while heating ribs. If you like your ribs on the sweet side, use the ketchup or BBQ sauce, if you think your ribs will be too sweet, just use the Worcestershire Sauce and less brown sugar. Adjust according to your desired taste and balance of sweet and sour. Makes approximately 8 servings for your senior parties. For Meatballs: Mix all ingredients in large bowl until completely well combined. Roll chunks about the size of half dollar into round balls. Place in oiled casserole dish and bake until firm and done in middle. These can be prepared in hot oil if preferred to oven for a crispier outer skin. For Meatloaf: Mix together the meats, salt, pepper, oatmeal, eggs, onions, peppers, tomatoes, ketchup in a large bowl. Spray a loaf pan with Pam or oil well on sides and bottom. Pack meat mixture into loaf pan and bake for about 1 to 1 1/2 hours at 350-400 degrees in the oven. Clean and devein shrimp then dry with paper towel. Heat oil in skillet on Medium Heat. Add shrimp in small batches and cook for 3-4 minutes until pink. Drain on paper towel. Repeat until all shrimp are cooked. Keep only 1-2 TB Oil in pan and add onions, garlic and ginger for about 3-5 minutes until tender. Add all remaining ingredients (except shrimp) and cook another 3-5 minutes stirring constantly. Mix purchased prepared Teriyaki Sauce,or first 5 Ingredients in bake in bag. Puncture roast with fork on both sides and place in bag with carrots, onions, and peppers. Seal bag and place in refrigerator overnight to marinate. Turn bag several times to make sure all ingredients and both sides of meat are equally coated. Here's another opportunity to work on other luau foods for your senior parties. Let beef stand 10-15 minutes then slice thin, about 1/4 inch thick across the grain in long slender slices. Thread beef slices on the skewers looping back and forth between pineapple chunks and peppers and onions. They should fill more than half the skewer when finished. Save marinate for basting. These can be done ahead of time and heated and browned off on the grill after being brushed or dipped in the leftover marinate teriyaki sauce. Serve 8-10 if sliced thin. Carrots can be used as garnish on the same plate or used as a side dish to serve with rice. Makes great appetizers, too. A fine addition to any luau menu. Remove grape leaves from jar. Rinse, separate, and pat with paper towel. Cook rice and add onion, ham, salt, pepper and marjoram until done and sticky. Use spoon to place enough mixture in center of grape leaf. Fold over each side then roll from the big end to the small end rolls that are the size of your index finger. Place side by side, end to end, in a casserole dish that has been sprayed with Pam. When finished, drizzle the juice of one whole lemon over the top. Season with seasoning salt or regular salt and pepper. Bake for 30-40 minutes at 350-400 degrees. Refrigerate. This lasts for days in refrigerator. Good to eat cold or hot. Makes 30-40 rolls. This also makes tasty luau menu appetizers. While these are not part of traditional luau foods, it is a wonderful compromise between sweet and sour tastes of other luau party recipes; and an extremely flexible part of any luau party plan. Senior parties are all about fun and ease of preparation. And that especially goes for luau party recipes and Hawaiian luau food. This side dish is very flexible. You can use broccoli, brussel sprouts, or cauliflower; or mix the three for a tasty compliment to your main luau dishes. I like to throw in some Pea Pods and Sliced Mushrooms during the last phase of cooking, too. Mix up your colors in this favorite luau menu for your senior parties. Luaus are about color. These luau party recipes are colorful as well as tasty. Mix soy sauce, vinegar, and sugar in small bowl and set aside. Heat skillet over medium heat and dry brown the sesame seeds lightly. Set aside. Add oil to skillet to heat. When hot, add red pepper, minced ginger, and minced garlic. Cook stirring constantly for about 1 minute. Add vegetables and cook for another minute or two. Keep the vegetables moving so they don’t scorch or burn. You'll want your luau party recipes to look and taste professional. Don't be afraid to use your favorite luau party recipes to enhance the vegetables for your senior parties. Luau foods are nourishing and taste great. Pour the soy mixture over the vegetables and stir well to get all vegetables coated. (Add pea pods and mushrooms here). Cover and cook until vegetables are firm but tender about 1-3 minutes. Sprinkle with toasted sesame seeds and serve hot. (A wok works well for this dish). Serves 6 - 8. 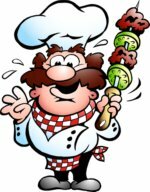 I think luau party recipes scream for vegetables that are cooked al dente, don't you? It's perfect for any luau menu. Wash and place potatoes in pot of water and cook for 15-20 minutes or until tender when punctured with a fork. Remove from pot and allow to cool for handling, then peel and chop. Spray Pam in large skillet. Add apple, cinnamon, ginger and sauté over medium heat for 10 minutes or apple is done but not mushy. Set aside. In a mixing bowl add sweet potato, banana, apple juice, and lemon juice. Mix or process in food processor until smooth. Stir in apple mixture and chopped apricots. Yum. Senior parties are so much fun, aren't they? So many colors and textures in hawaiian luau party recipes for your senior parties. Spoon into casserole that has been sprayed with Pam. Bake at 350-400 for approximately 20-30 minutes or until hot through. Garnish with slivered Almonds or Chopped Macadamia Nuts. Makes 8 servings. Your luau party plan to include this luau party recipe makes this dish a hit with any luau foods. My all time favorite dessert for crowds, and any season, is a cookie tart topped with fruit of the season and sliced like pizza. With all the spices of the luau foods, senior parties must have their sweet revenge on dessert. This one should be on every luau party plan. They are such a tasty part of luau party recipes. Purchase a large roll of sugar cookie dough from the dairy section of the grocery store. You will need one package for one cookie. You can also use package mixes for this. Just don’t select something too tender to handle. You are better off with sugar cookie consistency. One cookie will usually serve 8-10 people when fully loaded with the following luau foods. You will also need one can of butter cream frosting OR Sour Cream Frosting (like for carrot cake) per cookie. Again, you can easily make this from package mix or even from scratch if you want to. But it is hard to beat the consistency of Betty Crocker when it comes to frosting for your dessert luau party recipes, especially these cookies and luau cake ideas. 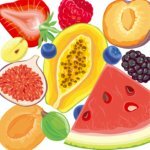 You will also need several colorful, but not too juicy, fruits that are in season. Try to get a good variety of contrasting colors, because you are going to slice and design your cookie. Pick colorful fruits that will enhance the colors used for senior parties and luau foods yet contrast each other. These luau party recipes are as colorful as they are wonderful on the palate. I love the hawaiian tropical look of strawberries, kiwi, bananas, and pineapple. But be careful with bananas and other fruit that changes color. You may have to dip in lemon juice to preserve, and don’t make too far in advance if you use bananas. Try Mango, papaya, peaches, berries, etc. Nothing that will make the tart soggy. At senior parties, you don't want soggy anything. If you have pizza pans, wonderful. If not, a large cookie sheet, or a round piece of cardboard wrapped in a couple layers of aluminum foil works, too. Spray with Pam. These luau party recipes will please as eye candy, too. Next, Roll out the cookie dough with even thickness to as large of round as you think you can handle without breaking. Place the dough on the cooking surface and flute the edges for effect, then bake until done, following directions on the wrapper. Better not to be too soft to handle, and yet not too crisp. Allow to cool until room temperature. Your luau party plan is coming together, isn't it? And these special luau dessert cookies will be a hit for your overall luau party recipes. Ice the cooled cookie with the frosting out to within 1/4-1/2 inch from edge of cookie. Frosting should be thick enough to hold fruit in place. Slice fruit across the grain either vertically or horizontally or both for different rows. Start with the outside and go all the way around with one fruit, one color. Press the sliced fruit firmly into the frosting. Make your own special senior parties design if you like. Above all else, be creative with your luau foods and your luau party recipes. Nothing is etched in stone here. Overlap the second fruit, second color, on the second row and complete the circle. Keep working toward the center of the cookie with different colors and different sliced fruit until center can only have one or two pieces. You can shave some dark chocolate over the top and add a sprig of mint or in this case an edible flower in the center. Your guests will be so impressed with your luau party recipes and how nicely these dessert recipes blend together for a perfect topper of the evening! You can do oblong cookies, too. Best to do fruit on an angle instead of straight up and down or straight across on these. It just looks nicer. Then you can cut the cookie in squares and serve from the pan. While not traditional luau foods, this is a wonderfully colorful blend to the colors of your luau party recipes. Who can refuse fresh homemade ice cream at senior parties? This is an extra smooth ice cream made with egg yolks. Makes about 2 quarts. 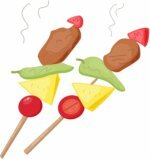 These are great do ahead luau party recipes or a wonderful way to get the interactions of your guests. Men love to flex their muscles on the crank of an old fashioned ice cream maker, don't they? Fits perfectly in any luau party plan, and these luau party recipes work well together on any occasion, but on senior parties, it's perfect. Mix egg yolks, milk, sugar and vanilla bean over the top of a double boiler until frothy. Set over simmering water and heat 15-20 minutes, stirring constantly. Cool and add cream. Freeze in a crank-type freezer (hand or electric according to directions for machine). To make this ice cream without a hand crank ice cream maker, when cooled, poor into refrigerator trays and freeze until mushy. Then spoon into large bowl and beat hard until fluffy. Whip the cream until thick and satiny and then fold into the ice cream mixture. Place back into trays and freeze until firm. Stir at least twice during the freezing cycle beginning. This takes a little more attention to detail to keep it stirred while freezing. But certainly can be a part of any luau party plan for senior parties. Serve with crushed roasted macadamia nuts on top. Great compliment to the cookie tart. Serves about 6-8. Pour sugar, corn syrup, water, salt, and cinnamon in ironcast skillet or heavy duty skillet. Insert candy thermometer and heat and stir constantly until sugar desolves. Lower temperature and cook uncovered without stirring to 240 degrees. Remove from heat, stir in macadamia nuts and pour onto wax paper lined cookie sheet. Spread as thin as possible and let cool until hard. Break apart, separating each nut. Makes about 1 pound. Hopefully, this has given you some ideas for your senior parties luau party plan with a flexible and enjoyable luau menu. Two things that are most important: First, seniors live it up and want to have fun. That means you, too. So, relax and have fun with your luau foods. And second, parties are supposed to be colorful. You've done your part with your luau party plan, the luau foods, the special colorful luau decor, and your ingenious entertainment right down to your outrageous luau invitations. Enjoy yourself! Seniors live it up! The good news is that it's a party. Senior parties are contageous and outrageous. Let yourself go. Enjoy!